There is a cool April's fool on CL today. 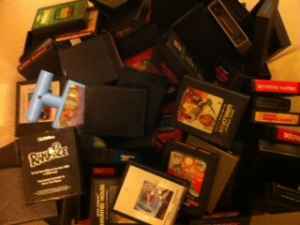 A simple posting that could be seen coming from an uninformed seller having a pic of a lot of Atari carts for sale. Looking at the picture, you can distinguish the famous shape of Air Raid, that is the holy grail of Atari collecting. Many dreams of retirement trailers in Mesa,AZ might crushed.